6064S- Steel Sprocket, DR-650SE 1996-2014. 525 Chain. Our Products >> Steel Rear Sprockets, USA >> 6064S- Steel Sprocket, DR-650SE 1996-2016. 525 Chain. 6064S- Steel Sprocket, DR-650SE 1996-2016. 525 Chain. 6064S- Steel rear sprocket for DR-650SE 1996-2016. 525 Chain. Available in 42T, 45T and 48T. Silver Zinc finish. 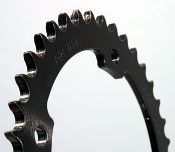 Steel Rear Sprockets, made in USA. * Select 42 Tooth Steel. (-$3.85) 45 Tooth Steel. (-$3.85) 48 Tooth Steel.